From the second I met Adele Uddo (a parts model who has artfully cradled everything from Prada's Candy to Hugh Jackman's head in her world-famous hands), I wanted to know all of her beauty secrets. Not only did Uddo exude the kind of exceptional warmth and inner beauty that, quite honestly, feels rare this day and age, but she also had gorgeous skin—practically poreless—and the kind of thick, lustrous hair most of us only dream of. Oh, and as I quickly found out just minutes into our meeting discussing her namesake brand Essentiel by Adele's starring labor-of-love product Essentiel Moisture ($39), she's an innovative, creative, and passionate businesswoman to boot. It's no secret that many (dermatologists included) cite our hands as the telltale marker of our age. After all, we tend to pour our youth-preserving efforts (and the contents of our wallets) into maintaining the likes of our faces and necks far before we consider the wear and tear our hands could slyly divulge. However, as a world-famous parts model whose hands are, quite literally, under a microscopic lens on a day-to-day basis, Uddo's had to pay her hands just as much, if not more, love and attention as she has on other parts of her body. While she describes herself as an "old bird" in the beauty industry, she explains on her website that she's actually doubled for leading ladies who could be her daughter. In other words, whatever she's doing (starting with the heartfelt formulation of her addictive multitasking moisturizer) is most definitely working. As Uddo explained to me during our meeting a few months back, a mantra of moisture, moisture, moisture has been the name of the game in terms of keeping her skin in tip-top shape. However, after years of never being fully satisfied with various products, she decided to take things into her own hands (literally) by experimenting in her kitchen to create an elixir that would not only deliver the high-quality results she craved but also serve as a multipurpose moisture remedy for her hands, face, and body. Well, she succeeded. In fact, her brilliant melding of essential oils, MSM, hyaluronic acid, coffee berry, aloe, plant oils, and other luxurious fare is the subject of my obsession. So to learn more about her inspiring venture into the skin and beauty industry—and all her covetable beauty and wellness secrets—I asked Uddo for her expert intel. From her day-to-day beauty routine to the ins and outs of formulating her own signature moisturizer, keep scrolling! Ahead, everything you ever wanted to know from world-famous parts model Adele Uddo. "What's funny is that as I've gotten older, my approach to skincare has actually become more streamlined and simple. When I was younger, I thought I needed more products to get results, but now I choose quality over quantity. "I do, however, require a bit more moisture than I used to. I've learned that if I don't nourish my skin with the right ingredients, I don't get that glow that comes naturally with youth. When I started body parts modeling almost 20 years ago, I realized right away I needed to keep my skin in shape for macro close-up photography which can be literally down to the cuticle. I tried a lot of products and experimented with different ingredients, and now I know what really works. "Also, as I grow, the "beauty' that stirs my soul is beyond what someone looks like. That intangible quality that makes someone truly shine. Surface beauty is lovely, but deeper beauty is breathtaking." "I was raised on an organic commune in Northern California, so I was introduced to natural skincare many years before it was popular. Back then, all the 'cool' kids were using commercial brands while I was the dork showing up to slumber parties with homemade goldenseal salve. "I used to argue with my mom to allow me to use products with chemicals, but now I'm grateful she taught me awareness about what I put on (and in) my body. For example, when I wanted to wear perfume, she insisted on essential oils, which I've now been using daily for decades." "Every day and night, I cleanse with Young Living's Orange Blossom Facial Wash ($40). It's a foaming cleanser with andiroba, açaí oil, and other essential oils. It's gentle, yet it cleans my skin deeply without leaving me feeling dry. "Then, I moisturize with an all-in-one lotion that I created for face, hands, and body. I hand-picked all the ingredients: essential oils of frankincense, helichrysum, geranium and lavender, hyaluronic acid, coffee berry, MSM, and raspberry leaf. 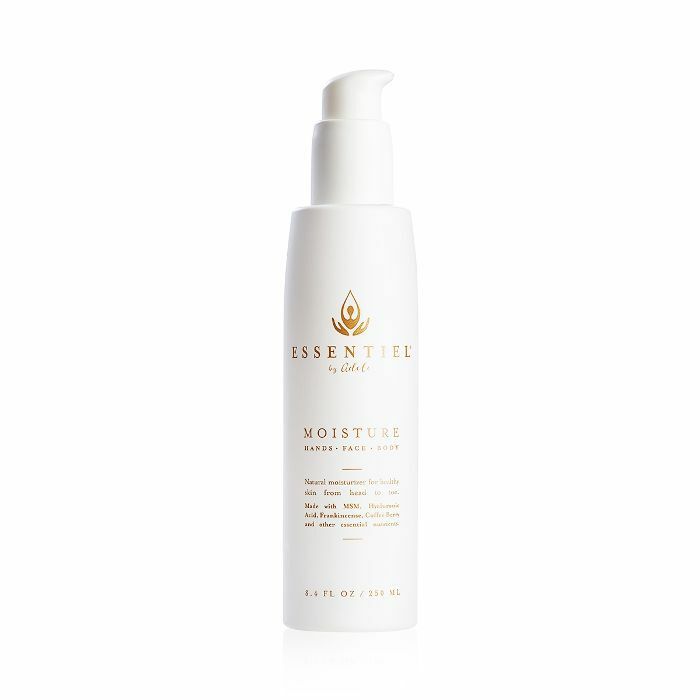 It took me years to perfect the formula, but Essentiel Moisture ($39), or as I like to call it, my lotion love child, is what keeps my skin looking healthy, even magnified in high definition. It gives me that dewy glow without feeling greasy or heavy. I finally have my ideal moisturizer!" "After moisturizing, I apply a natural sunscreen. I like Coola's Mineral Face SPF 30 Matte Tint Moisturizer ($36). I believe topical sunscreens work better than those mixed in moisturizer. Coola's has a matte finish, which is nice, and I always apply some on my neck, chest, and the back of my hands. "Facial wash, moisturizer, and SPF are my three daily essentials, but less frequently, I'll use other products to infuse my skin with additional supplements—just not as a daily dose. Sometimes I'll add a few drops of face oil like this one from RMS into my lotion for extra hydration, especially in the winter, and a couple times a week I exfoliate with Kypris's Moonlight Catalyst Refine & Renew ($77). I love that it acts as a natural retinol. "Lately I've been using the January Labs Brightening Tonic ($28) to exfoliate with organic sugar and tea extracts, and some nights I'll use organic castor oil on my eyelids to help grow longer/stronger lashes. On days when I wear foundation, I use Vapor's Atmosphere Soft Focus Foundation ($54) which is made with oils such as camellia seed to encourage extra-smooth skin." Moisture: "Hydrated skin is healthy skin, and healthy skin is beautiful at any age. A lotion that provides healthy nutrients is like food for the skin. If I miss moisturizing, my skin really suffers. In my job, even my nails need to be well-nourished. When they get dry, they become brittle and break." Diet: "I'm a big believer in beauty from the inside/out. I grew up on an alternative farm, where my mom went through a 'manic-organic' phase and our diet got very restrictive, which I don't condone. On the positive side, however, her super-strict ways instilled in me an awareness of what I eat. Ultimately, I believe in balance and enjoying life, but I definitely approach beauty and health from a holistic point of view." MSM: "I take MSM supplements whenever I want my nails to grow quickly for a job. MSM is a sulfur compound that's most concentrated in skin, hair, and nails. Sulfur is the third most abundant mineral in the body and is essential to produce collagen. For centuries, skin problems such as acne and eczema have been treated with sulfur compounds. Ancient Romans soaked in sulfuric baths, and some say it was the original fountain of youth. I love this ingredient so much, I put it in my moisturizer." Essential Oils: "I was introduced to essential oils many years ago, and I still use them every day. They are great for balancing skin and regenerating cells. I even take them internally and diffuse them in the air. The health benefits are powerful, for instance, the antioxidants in one ounce of clove oil are equal to 450 pounds of carrots." "Besides looking for high-quality ingredients that pack a lot of antioxidants, vitamins, minerals, fatty acids, and essential oils, I think the key is to also look for the things you want to avoid like parabens, sulfates, phthalates, artificial fragrances/dyes, petrolatum, silicones, PEGs, etc. I like shopping at places like The Detox Market since their standards are high and I know that I can trust the quality." "I first conceived Essentiel in my kitchen, and then when my friends began asking for more of my homemade moisturizer, I teamed up with a top boutique formulator to take it to the next level. We worked together to customize the product to become something I fell in love with and was excited to share. I didn't go to a manufacturer for a generic formula. I wanted to be part of the process and test it extensively. I loved getting feedback from friends and incorporating people who I trust in the process. "I've always joked that I hope to someday contribute more to society than nice nail beds. My mission for Essentiel is to provide a clean premium product that serves many purposes at an affordable cost while donating a portion of every purchase to NOLA Tree Project, an environmental nonprofit in my hometown of New Orleans." Massages: "When I'm relaxed, I feel and look better. I live near a lovely Ayurvedic practitioner, Julie Bernier, who taught me about Abhyanga (self-massage), so now before bed, I take a few deep breaths and massage my lotion into my legs, feet, arms, and neck. It's really nourishing at the end of the day and helps me slow down. Just taking those few minutes a day helps me connect with myself and replenish my skin." Baths: "I get super busy and often only have time for a shower, but every time I run a bath, light a candle, and soak in some Epsom salts and essential oils, I feel like a renewed person. So good for the soul (and skin)!" Eating well: "My husband and I love good food and generally gravitate to healthy choices. Our date nights are usually spent at restaurants with a nice glass of vino—or two." Move: "I sit a lot on set and in front of a computer screen, so it is important that I move my body to make myself feel grounded and more relaxed, whether it be heading out for a hike with my dog, taking a yoga class, or turning on a favorite tune and letting my body shake out whatever it feels." "I know I sound like a broken record, but moisturizing is the most important to me, hands down (pun intended). I used to put face cream on my hands, but now I have a moisturizer that has the high quality I need for my entire body. I believe that when your moisturizer is made with the right ingredients, you don’t need separate creams for eyes, face, and body. "I admit to being a bit obsessive about moisturizing, and I am not saying everyone needs to do the same, but if I didn't keep my skin moisturized, I wouldn't work. The health of my skin depends on what I feed it, so I made refillable travel sizes of Essentiel Moisture to keep in my purse and other easy-access places. I also often use things you'd find in your own cupboard to moisturize, such as coconut oil, olive oil, shea butter, and almond oil. On days when I'm shooting, I amp up the moisture and even add a few drops of essential oils to my hands. It doesn't have to be difficult. I'm all about #SimplifyingSkincare."